Having invited other squadrons for its 90th anniversary, the 23° Gruppo organized a spotters event on the arrival day. Giampaolo Tonello reports back from the first Italian spotters day. The Italian Air Force's 23° Gruppo celebrated its 90 years of existence with a reunion on June 22nd, 2008, at Cervia AB, the home base of the 5° Stormo Caccia Intercettori. The 23° Gruppo was established on July 7th, 1918, and from then on it has taken part in all major events of Italian military history. In the year 2003, after having flown the F-104 for many years, the 23° Gruppo received the leased F-16 Air Defense Fighter and achieved combat readiness with the new fighter soon after. For the occasion, many squadrons from around Europe were invited and for the first time ever in Italy, a "Spotter Day" was held on the arrival day on June 20th. After the gate opened at 8.30 AM, a large crowd of spotters entered the base to attend this well-organized event. A large area just in front of the flight-line was accessible to the photographers. From that position, it was possible to witness the landing and taxiing of the visitors. At the end of all the arrivals, it was also possible to access the flight-line. Furthermore the 23° Gruppo had created some commemorative gadgets such as patches, pins and squadron prints, which were in high demand with the enthusiasts. They also had organized a scramble demonstration with two F-16s, followed by some low formation passes with five machines. 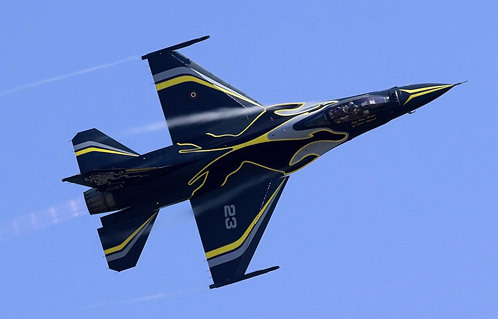 One of these five Falcons was the first Italian F-16 in special color markings piloted by the 5° Stormo Commmander Col Di Marco, who also performed some extreme maneuvers to demonstrate the F-16's agility to the public. We would like to thank the 23° Gruppo and 5° Stormo for organizing this first Italian spotters day and we hope that some of the other squadrons and wings will soon follow.